Kazunari Ninomiya, Satoshi Ono, Masaki Aiba, Sho Sakurai, Jun Matsumoto, Yu Kashii, Hirotaro Honda, Hanae Ken, Chieko Matsubara, Mariko Miyamitsu, Kotaro Shiga. The Skinny: A lighthearted character drama about four starving artists in 1960s Japan, Yellow Tears is both a commercially and artistically successful exercise in nostalgia, thanks to its idol stars and a director with the right sensibilities. Upon learning about Isshin Inudou's latest film Yellow Tears (or Kiiroi Namida), I was surprised that it was actually produced without the help of a major distributor or television station. After all, it's a lighthearted exercise in nostalgia that brings Johnny's Entertainment's Arashi, one of Japan's most popular boy bands, to the big screen for the first time since 2004's Pikanchi Life is Hard Dakara Happy. Not only have the group's individual members found both critical and commercial success as actors, but films such as Always - Sunset on Third Street have proven that collective nostalgia can rake in the cash at the box office. But then I also discovered that the film is actually produced and distributed by Arashi's record company J Storm, meaning that Yellow Tears is really a vanity project to promote the boy group. Fortunately, thanks to experienced independent film director Isshin Inudou, the film proves itself to be more than just an extended idol special. Based on a story in a manga called "The Young Ones" by Shinji Nagashima, Yellow Tears focuses on four aspiring artists struggling in 1963 Tokyo: manga artist Eisuke (Kazunari Ninomiya), oil painter Kei (Satoshi Ono), composer-singer Shoichi (Masaki Aiba), and author Ryuzo (Sho Sakurai). 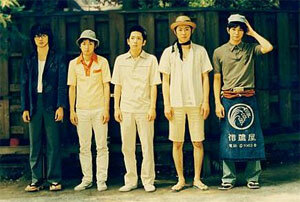 The four initially meet in a scheme by Eisuke to convince his ailing mother to move to Tokyo. After its success, the four split up believing that they will never meet again. However, everyone ends up moving into Eisuke's small apartment two months later because he happens to be the most successful of the bunch. With no income, the three end up relying on Eisuke and the local pawn shop for food money because of their unwillingness to do anything that doesn't involve art ("I won't sell my body for money," one character says.). Eventually, the group does manage to come across some wages, and Eisuke suggests that they take the summer to develop their respective artistic voices before worrying about money again. Thanks to a bit of help from local delivery boy Yuji (fifth Arashi member Jun Matsumoto, whose appearance in the film amounts only to a glorified cameo), the four experience a summer filled with unrequited love, friendship, the pursuit of art, and finding ways to eat cheaply. Like last year's comic-based Honey and Clover (which starred Arashi member Sho Sakurai), Yellow Tears deals quite a bit with aspiring artists and what art means to them. However, Honey and Clover became too distracted by its romantic subplots to actually say anything meaningful about the creation of art. While Yellow Tears does have its share of romantic subplots, the screenplay by Shinichi Ichikawa never strays too far from questioning the effect art has on each character. As a director who has spent the last several years alternating between commercial and independent filmmaking, Inudou probably felt a strong connection to the film's themes; Eisuke's dilemma of having to choose between drawing what sells and drawing what the artist wants probably struck a chord with Inudou during the making of the film. Thanks to such sensibilities, Yellow Tears actually feels like a quality piece of cinema with something to say. However, don't assume that Yellow Tears is another heavy-handed art film. Most of the time, Inudou actually keeps the film's tone lighthearted, fitting the film's relaxed summer setting. Even the more heavy-handed moments towards the end of the film feel rightfully earned because the characters have been properly set up. The narrative of Yellow Tears favors character development over plot exposition, and the chemistry between the group members makes the friendship between these artists the strongest and the most convincing aspect of the film. Of course, having Ninomiya, the strongest actor in the bunch (as proven by his performance in Clint Eastwood's Letters from Iwo Jima), play the central character of Eisuke probably helps things considerably.